(StatePoint) A good steak and glass of red wine offer a delightful traditional pairing. 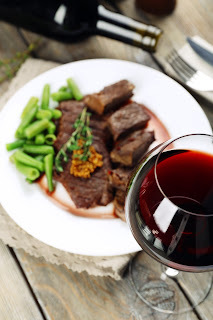 A way to elevate this experience is to choose an Amarone della Valpolicella, a traditional red wine from Italy, to accompany a perfect cut of steak with high marbling content for more flavor. Considered the gentle giant of Italian red wines, Amarone has bold yet subtle characteristics, which pair nicely with a nice cut of NY strip steak. Produced with indigenous grape varieties (Corvina, Rondinella, and Molinara) of the Venetian regions, Amarone wines are full-bodied, rich, well-balanced red wines. Since Roman times, winemakers have been using a specialized technique called the Appassimento method, which consists of drying the grapes on straw mats during the winter months to concentrate the fruit’s aromas and flavors. An iconic 200-year old Amarone producer, Masi Agricola, known around the world for the quality of their wines produced over seven generations, has revolutionized the Appassimento technique. The winery has blended historic winemaking methods with modern research and technology: making their own selection of proprietary yeast, replacing straw mats with bamboo racks and drying the grapes in a temperature- and humidity-controlled environment, and conducting a double fermentation process. The result is an offering of five Amarone wines rich in history and personality. One of the acclaimed wines of the portfolio is the 2011 Masi Agricola Costasera Amarone della Valpolicella, with a suggested retail price of $63.99. This deep ruby-red wine has powerful, complex aromas of dried plums, flavors of baked cherries, chocolate and cinnamon. It tastes dry on the palate, with a soft and bright acidity; the delicate, structured tannins precede a long finish. Select a rich cut with visible marbling, which will have a higher fat content to pair with bold red wine. A good option would be a New York or Kansas City strip steak. This cut is affordable, has texture and is flavorful. Purchase a strip steak with a thickness of 1 inch. Season with salt and pepper then grill on high for 2-4 minutes. Decrease heat to medium temperature until desired degree of doneness is achieved, such as medium rare or well done. Pair your strip steak with an Amarone wine. It is full-bodied with balanced tannins, that will stand up beautifully to this flavorful cut. The high tannins will also act as a palate cleanser during the meal. Serving a beautiful steak and glass of high-quality Amarone will bring your experience to the next level. No Comment to " The Perfect Pairing: Amarone Wine and Prime Strip Steak "